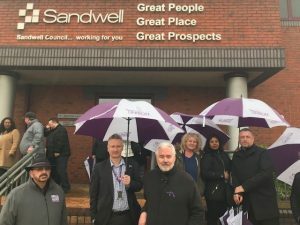 UNISON took part in the first ever Workers’ Memorial Day event held in Sandwell on 27 April. Speakers from our sister trade unions also attended. Cllr Steve Trow also gave his commitment to continue to work with trade unions to make workplaces as safe as possible. 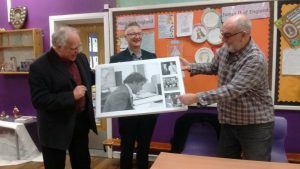 Sandwell Leisure Trust on 19 March signed up to the TUC’s Dying to Work Charter that promises to treat any workers unfortunate enough to be diagnosed with a terminal illness with dignity, as outlined in the Charter. Sandwell UNISON’s AGM voted unanimously to support the forthcoming national demonstration against racism. See below for the flyer. 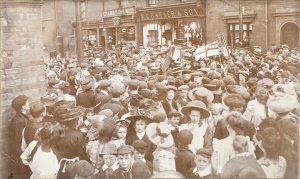 The AGM also voted to support the Birmingham United demonstration on 24 March in opposition to the FLA’s plan to march through Birmingham.